Vaspian’s Call Reporting and Wallboard services provides powerful, real-time reporting capabilities that allow complex data to be searched quickly and interpreted in simple-to-understand graphs and interfaces. Call reporting allows you to search historical calls in real time. Wallboard is used to give a bird’s eye view of what is happening now, as well as what has happened over a particular time interval (1 hour, 4 hours, 8 hours, etc.). Read more about both services, as well as the display groups used within them below. Real-time reporting provides a historical view of call data. Pre-defined reports provide quick access to top callers, top answers, busiest users, busiest hour, busiest day and missed calls. Build display groups to easily allow for reporting of any group of users (i.e. department, team, call group or queue). ‘Custom Reports’ allow you to search custom date ranges and customize the data you see. ‘Call Info’ button provides a visual representation of each call and its segments from cradle to grave. Custom Reports: Search custom date ranges, report types, group by hour or day, and filter by display group. Today's Calls: Call list including time, direction, calling number, dialed number, ring time, call time, answering party, class of service, site name and "Call Information' button (provides visual representation of each call and segments). Today's Top Callers: Bar graph of outbound activity for all extensions. Tabbed view by call count or call duration. Today's Top Users: Bar graph of inbound activity for all extensions. Tabbed view by call count or call duration. Today's Top Answers: Bar graph of inbound activity for all phone numbers. Tabbed view by call count or call duration. Today's Missed Calls: View unanswered calls by hour (calls that ring and go unanswered). Today's Busiest Hour: Bar graph of all calls by hour. Tabbed view by call count or call duration. Week's Busiest Day: Bar graph of all calls for the week broken out by day. Tabbed view by call count or call duration. These reports provide a complete listing of calls including: time, direction, calling number, dialed number, ring time, call time, answering party, class of service, site name and call information button. Reports can be searched predicatively by any filter listed in the call records search filter. Multiple filters can be used to narrow down your search. The 'Search Box' located on the right hand side of the orange bar allows you to search all data fields. Column headers are sortable in ascending or descending order. Click the 'Call Info' icon on the right hand side of a call record for a visual representation of each call detailing each of the call segments. 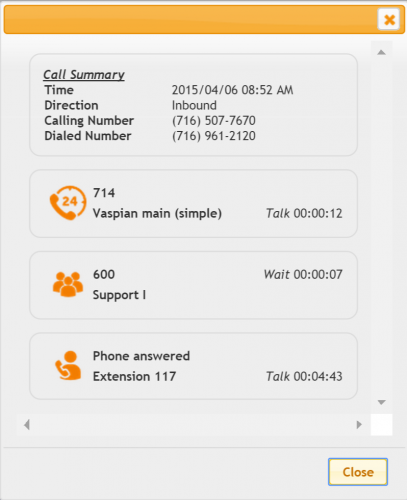 Call Info Button: Provides call segment in detail. In the above example, a call hit the Vaspian main auto attendant for 12 seconds, where the caller chose the 'Support' option in which it rang for an additional 7 seconds before being answered by extension 117. The caller spoke with extension 117 for 4 minutes and 43 seconds. The 'Top Users' report can be used to show extesion call data. Hover over bars on the graph to see associated data. Call Counts: Number of calls by extensions. Talk Times: Total Talk times by extensions. Call Data: View and export actual data. Click the Inbound/Outbound series labels in the graph legend to show/hide more graphing data. The 'Busiest Hour' report is an extremely useful report for staffing or for viewing call data on a per-hour basis. Call Counts: Number of calls by extension. Talk Times: Total talk times by extension. 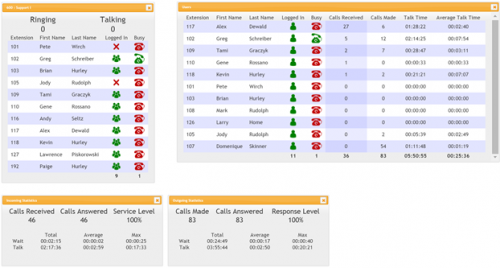 Provides a Visual Wallboard with real time call center metrics. Wallboard updates automatically without refreshing. Wallboard is often used to output call or employee statistics to a public viewed television or flat panel TV. Build Display Groups to easily allow for reporting of any group of users such as a department, team, call group or queue. The Vaspian wallboard is a great tool to provide a real time view of what is currently going on within your organization, as well as a bird's eye view on call center metrics. This data can be used on a PC or output to a wall mounted television. To launch the wallboard, click on the wallboard link. You will need to set up at least one display group before doing so. Select the appropriate display group to be viewed. Select the time interval you wish to see data for. If desired, check the 'Include Internal Calls' box to see internal calls. Depending on the paramenters selected when building your display group, you will see multiple windows or tiles with different call data. Call Group (Upper Left): Show information regarding a particular call group. These tiles are only available if a call group is selected for the chosen call group. User Data (Upper Right): Show user information, phone status, hook status and call metrics. Incoming Call Statistics (Lower Left): Show statistics regarding inbound calls, service level, wait times, talk times, etc. 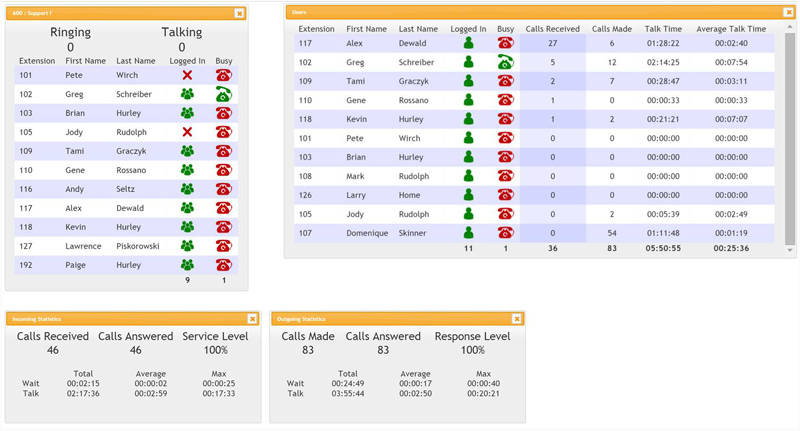 Outgoing Call Statistics (Lowe Left): Show statistics regarding outbound calls, response level, wait times, talk times, etc. Depending on the parameters selected when building your display group, you will see multiple with different call data. Phone Status (Logged In/Out): Users can sign in and out of their phone using the Log In/Out feature. User Hook Status: When the icon is red the user is available. When the icon is green the user is on a call or is busy. Calls Received: Total number of inbound calls answered. Calls Made: Total number of outbound calls made. Total Talk Time: Sum of all talk time. Average Talk Time: Average talk time of all calls (incoming/outgoing). How many of those calls were answered. Service Level: Percentage of total calls answered. In addition, the inbound statistics will show total, average and maximum wait times and talk times. Response level: Percentage of total calls answered. In addition, the outbound statistics will show total, average and maximum wait times and talk times. Please Note: Calls answered include any calls that are answered by an answering machine, voicemail or live person. Call group windows are designed to show the number of calls that are currently ringing or talking, as well as user status as it related to the particular call group. As users have the ability to sign in and out of a particular call group, this window will give their membership status (Logged In/Out), as well as their current hook status (On Call/Available). The call group window(s) are available if one or more call groups are selected when building a display group. When multiple call groups are selected within a display group, each will be opened in a separate window or tile within the wallboard. Ringing: Current number of calls ringing into a particular call group or queue. Talking: Current number of calls that have been answered and are on the phone. 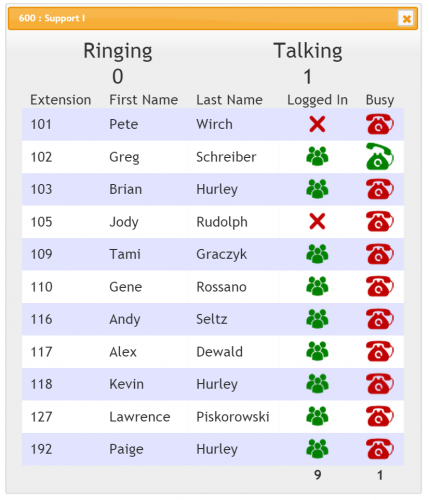 Call Group Status (Logged In/Out): Users can sign in and out of a call group by programming a button on that user's phone for the designated call group. Busy Status or Hook Status: Red is available for call. Green is on call or busy. Once a display group is built, report types and wallboards can be customized to only show data for members or elements contained within that display group. Display Groups: View of manage existing display groups. Select users, call groups or phone numbers to add. 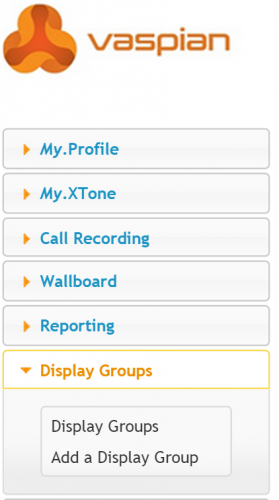 Add a Display Group: Allows users to create new display groups by selecting users, call groups or phone numbers. Name the display group in the 'Display Group Name' field. In this example, we have built a display group so that we can isolate and see call information for our 'Solution Center'. Select the users to be included by checking the box to the left of 'Extension' and 'Name'. By selecting these users call statistics, all calls including those extensions will be displayed. Select any desired call groups. Please note: Selecting call groups will provide additional 'Call Group' data to the wallboard service (see wallboard section above). Select phone numbers to utilize the 'Busiest Number' report and to see information pertaining to number of calls received or made on a particular selection of telephone numbers.